For the past month (23 August to 22 September 2017), in the continued search for creative ways of reading, I have noted down a small section from each day’s books. The following has emerged from one purposeful arrangement of this material. He was so in love with books that he would prop one up beside his shaving mirror and read whilst shaving, which must have been a hazardous occupation. Language shows clearly that memory is not an instrument for exploring the past but its theatre. ACL – ACCELERATED CONTACT LANGUAGE – was, Scile told me, a speciality crossbred from pedagogics, receptivity, programming and cryptography. Printing is ‘the artillery of thought’. Workshop grey greenish, light but electric also; no bare arms except in packing rooms etc….figures with book compressors, stapling, scrimming; magazine sheet assembly; girls with sewing machines, comical spoofs; occasional solid bright colour, e.g. Blue covers ink or overalls. NOISE. Anybody who has persevered thus far with this book without skipping may be assumed to be a dedicated reader. He who seeks to approach his own buried past must conduct himself like a man digging. When faced with the blank space on the map, we turn to the fantastical. Life came before art with her – and what a life! Ezra remarked that he thought she got more out of life than was perhaps in it. He was a very useful father to have, for he knew a great deal and didn’t mind answering questions. All sciences are devoted to the quest for truth; truth can neither be apprehended nor communicated without art. History therefore is an art, like all the other sciences. But instead of this necessary risk of ‘falling in love,’ what we have today is a worldwide movement directed against any sort of risk: from our decadent Western permissive societies to the Islamic fundamentalists, all of them are united in the fight against desire. Repossessed by its owner, the fragmented, headless body of surrealism becomes a vehicle for irony, resistance, humour and self-expression. When a man rides a long time through wild regions he feels the desire for a city. Miami’s South Beach is nothing like a white cube. Pauvre Philippe, je me demande quelquefois si tout son mystère ne le fatigue pas de temps en temps. Schwer zu wissen für den Autor, wie weit er gehen darf, wie weit heute, wie weit morgen. Auch sehe er sich nicht als Lehrer; den das könnte bedeuten, dass er selbst nichts zu lernen hätte. Schnellläufer sucht Balletttänzerin in Kongressstadt – Das Zusammentreffen dreier gleicher Buchstaben. Deformation durch Schriftstellerei als Beruf, Popanz der Öffentlichkeit; als lebe man, um etwas zu sagen. Wem! Er allerdings habe keine Lust, sich mit Texten abzugehen, die nur für Maschinen von Interesse seien. Der Wärter in einem Leuchtturm, der nicht mehr in Betrieb ist; er notiert sich durchfahrenden Schiffe, da er nicht weiss, was sonst er tun soll. Ich lebe jetzt ohne Vorsatz. Apples can be forgotten about, but not bananas, not really. They don’t in fact take at all well to being forgotten about. They wizen and stink of putrid and go almost black. We are proud, handsome and predatory. We hunt machines, they are our favourite game. We invent them and then hunt them down. And the way it made my feet feel. Yesterday’s thoughts about the Frankfurt Book Fair in the early 1970s find echoes in today’s reading of Max Frisch’s Aus dem Berliner Journal, a record of the Swiss writer’s time in Berlin in 1973-4, published by Suhrkamp in 2014. As well as hearing of the writer’s everyday life and the move to Berlin, we also learn of the time Frisch spends in what he calls DDR-Berlin, giving readings, meeting other writers and discussing the local editions of his books with East German publishers, Verlag Volk und Welt. He enjoys the company of other writers, and spends time with the likes of Christa Wolf and Wolf Biermann on one side of the wall; Günter Grass and Uwe Johnson on the other. It’s a timely reminder that publishers and writers have always played a role in crossing cultural and political lines in Europe, something that might be important as British publishers and writers are forced out of the European Union by their careless government. It’s an interesting footnote that Verlag Volk und Welt did not survive the unification of Germany, although the imprint is now owned by Verlagsgruppe Random House. I remember that my father carried many things in his pockets and reflect that most of these either no longer exist as everyday objects, have been replaced by technology or are socially unacceptable. This list, presented in alphabetical order, will be familiar to some but perplexing to others. Lately I have been trying a new kind of reading. I take three books and read them regularly at different times of each day, planting thought seeds for the coming hours and encouraging synaptic serendipity. For the past week I have started my day with the exchange of letters between John Berger and John Christie published as Lapwing and Fox. In the afternoons I have been reading The Living Stones by Ithell Colquhoun and at night it’s Second-Hand Time by Svetlana Alexievich. In my head today I have the image of deer appearing from the woods to listen to a flute playing; I imagine encounters with buccas in St Keverne; and I travel with Anna M. back to the site of her exile in Karaganda. The thoughts play off each other as I experiment with reading in this way. It’s an interesting exercise; the interplay between the three books sparks many a creative thought and adds up to more than the sum of the pages turned. Although sent from Saxmundham in Suffolk, the picture on the card is from faraway British Columbia. 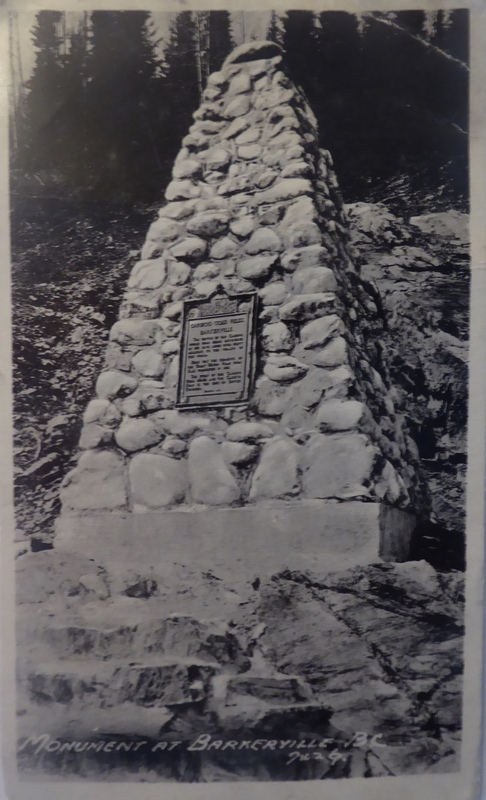 It shows a monument in Barkerville with an inscription commemorating old Cariboo, ‘whose gold fields discovered in 1861 have added over sixty million to the wealth of the world’ and notes that here was ‘the terminus of the Great Wagon Road from Yale completed in 1856’. Barkerville, it turns out, is named after William (Billy) Barker, born in March, Cambridgeshire, in 1817, two hundred years ago this year. He moved to California in the 1840s and then to Canada, where he found gold, mining a total of 37,500 ounces in his life. In spite of that great wealth, he died a poor man on July 11, 1894 in a nursing home in Victoria, British Columbia. 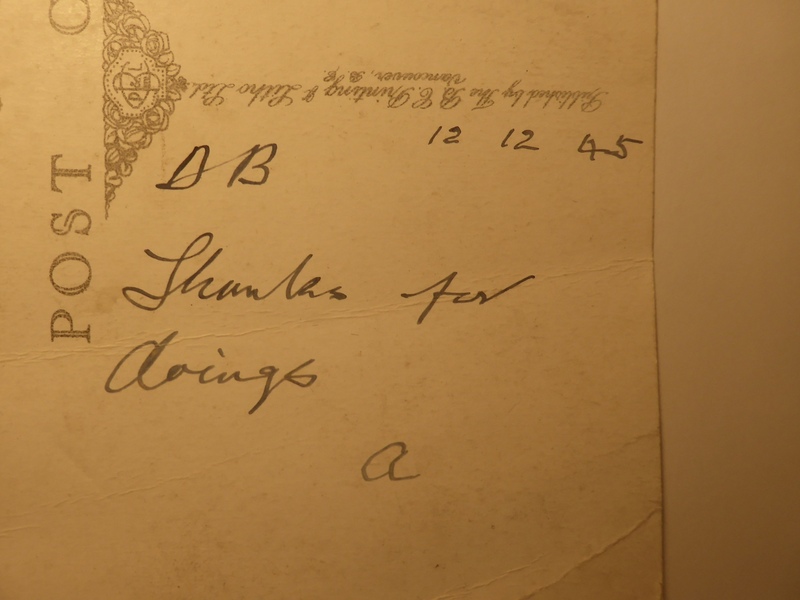 Why did A send this card to Mr Crisp in 1945? Was there a family connection with Billy Barker and the Cariboo Gold Fields? What were the ‘doings’? In Austin Dobson’s A Bookman’s Budget of 1917, the compiler reproduces one of his own poems (On the Shelf first published in Methuen’s Annual) concerning the history of the books on the aforementioned shelf. The poem contains the following lines that provide a fitting description of much publishing, valid as much in 2017 as they were a hundred years ago. We were promptly ‘remaindered’ at twopence a head. In the 1970s, while I was working for the publishing division of the Xerox Corporation, the company engaged in something called the Records Retention Programme. The purpose of this was to distinguish between records and files (loads of paper) that needed to be kept for legal or operational reasons, and to decide which could be disposed of, which could be stored more efficiently on microfilm, which moved to storage facilities that were cheaper than filing cabinets located in prime city centre offices, and which needed to be kept near to the people who generated it. It was a major operation and one that would, it was calculated, save the corporation as a whole more than fifty million dollars. Now that such records are mostly kept in digital form, I wonder if the expense associated with retaining, organising and archiving organisational data is fully understood and taken into account by the companies that generate them. I suspect not and that the cost of keeping data that is surplus to requirements is running out of control. Does anyone know, or care, how much time, energy and money is squandered building and maintaining unnecessary server farms, mountain caverns, desert bunkers and tundra outposts? Someone certainly knows how much money is to be made by the companies doing the data warehousing job. 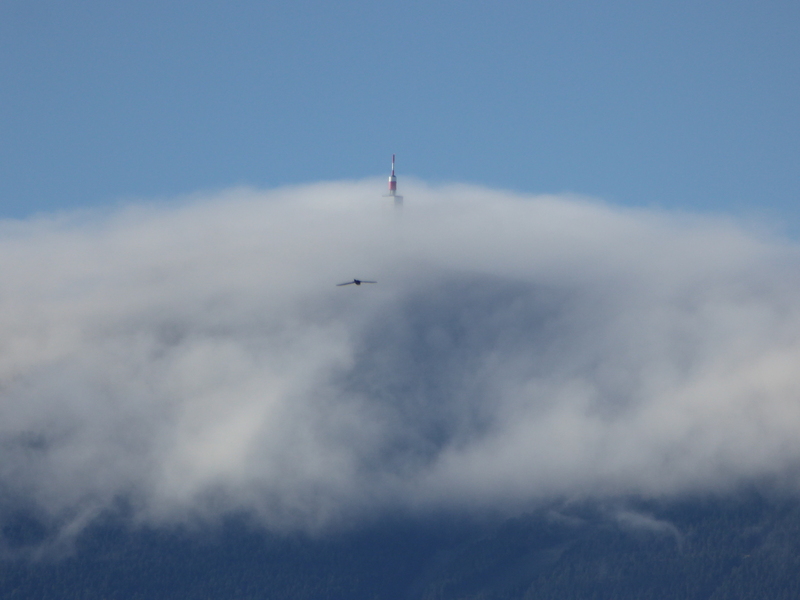 This picture of a raptor near Mont Ventoux was taken in memory of Tommy Simpson who died there on a hot afternoon fifty years ago today during the 1967 Tour de France. His autobiography, Cycling Is My Life, was published in the same year.